St. Andrew's Church was built part-way along the north side of George Street. Opened in 1784, this was the first church to be built in Edinburgh’s New Town. 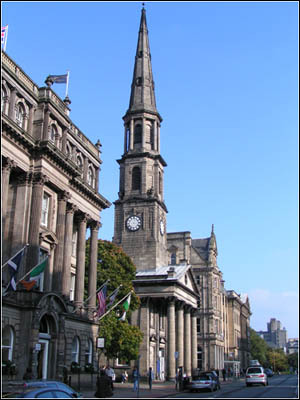 St Andrew’s Church goes down in history as being the setting, in 1843, of the Disruption of the Church of Scotland. Enraged by the Civil Courts’ infringements on the liberties of the Church of Scotland, around one third of the ministers present at the annual General Assembly walked out, cheered by the public outside, and formed The Free Church of Scotland. Today the congregations are those of the Church of Scotland.